We are one of the renowned organizations involved in supplying, wholesaling, retailing and trading a wide gamut of Face Mask. 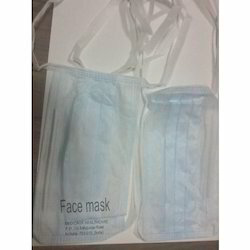 These face masks are developed and designed using high quality non woven fabrics in accordance with industry laid norms and guidelines. All the products offered by us are widely used in hospitals, clinics, nursing homes, pharmaceuticals and other food processing industries. Furthermore, clients can avail these products from us with various specifications as per the need of our clients need.